Death of Lieut. N. A. Astbury. The sad intelligence has reached Northop that Lieut Neville Ayrton Astbury, the eldest son of Mr. Astbury, Grosvenor House, Northop, has been killed in action at the Front. The Lieutenant , who was 27 years of age, was a native of the village, and where his father is the assistant overseer for the parish. He was educated at the Hawarden School, and afterwards became a student at the St David's College, Lampeter. Subsequently he left this country for Canada, where he obtained an important appointment in the branch establishment of the Union Bank of Canada at Alberta. Soon after the war broke out he, like many other patriots from the mother county, enlisted. He was, eventually, drafted to the Front, where he had been about six months, and the official information of his death was received by his father on Friday last. 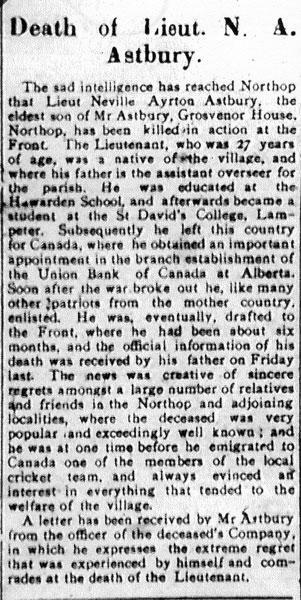 The news was creative of sincere regrets amongst a large number of relatives and friends in the Northop and adjoining localities, where the deceased was very popular and exceedingly well known; and he was at one time before he emigrated to Canada one of the members of the local cricket team, and always evinced an interest in everything that tended to the welfare of the village. A letter has been received by Mr. Astbury from the officer of the deceased's Company, in which he expresses the extreme regret that was experienced by himself and comrades at the death of the Lieutenant.